Congratulations on your new Garadget! The setup typically takes 20-30 minutes to complete. Here’s a quick list of gotchas in case you have to skim through this short read. Complete the WiFi connection before mounting your Garadget. Be gentle around USB connector. If forced it may break off and it will take 4-10 days for replacement to arrive. Adhesive pad must fully sit within the recessed area of the mount. The surfaces should be flat, clean and dry. Small number of openers (notably security+ 2.0 openers) do not support a simple push button console and may require the use of a spare native remote. If at any point you get stuck, please refer to the troubleshooting guide for solutions. At the end of the successful setup procedure, Garadget’s LED should be slowly pulsing cyan, your mobile device will reconnect to the Internet and the app should list your new controller. If you don’t see the new device in app, try logging out and logging back in. Click on “R” button to reset the Garadget and make sure it successfully re-connects. Please solicit the help of the licensed and insured professional if, for any reason, you are uncomfortable with performing the Garadget installation yourself. 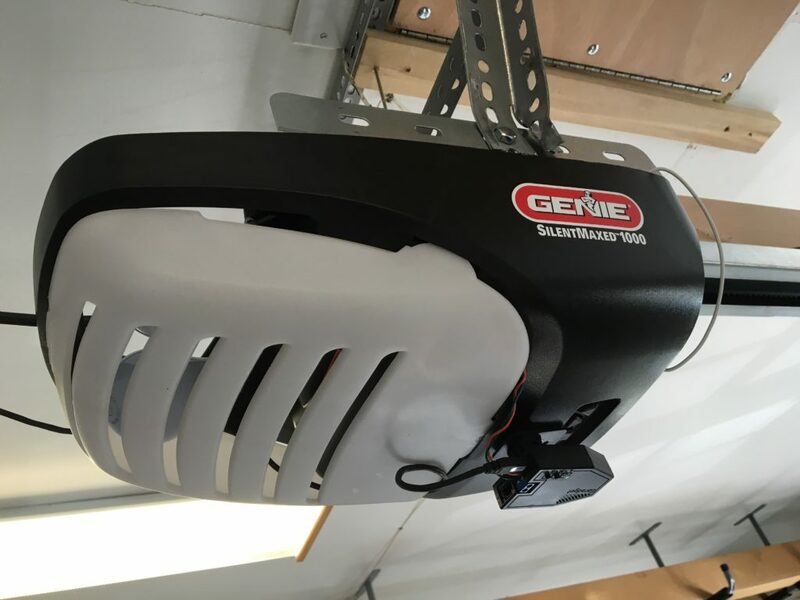 Since you will be operating your garage remotely, it is critical that your garage door opener has functioning safety features such as motion reversal when encountering obstacle, photo eye (edge sensor) etc. 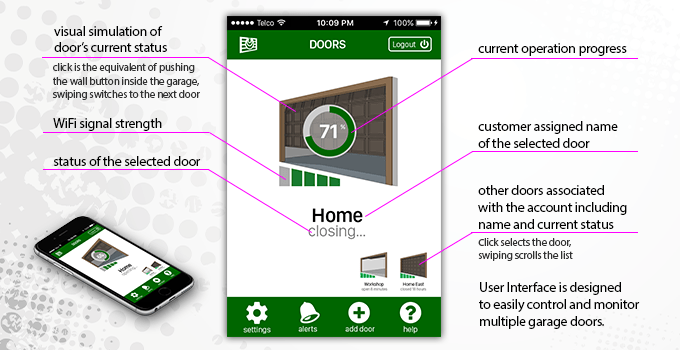 Majority of garage door openers can be operated from inside of the house using a wired wall console. Garadget acts as a computer-controlled push button and its blue terminal should be wired to the same two contacts on the opener used for the wall console. 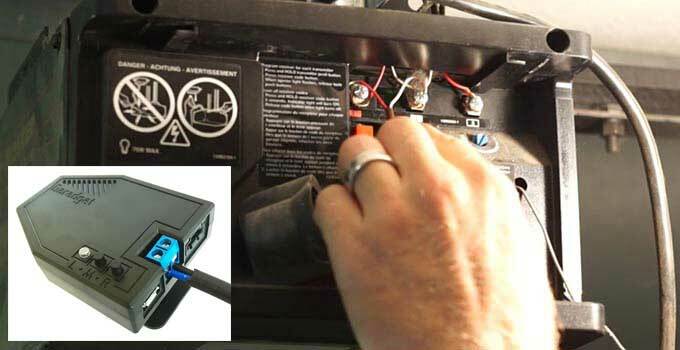 You can determine the connection by tracing the wall console wires visually or by checking the installation instruction for your specific model of the garage opener. If you need help, please check out the examples in our community board or contact us directly. Use the included screwdriver to loosen both screws in the blue terminal on the back of the Garadget without completely removing them. Push the stripped ends of the included controller wire under the tabs of the terminals then tighten the both screws. The polarity of this connection is not important. The other end of the control wire connects to the terminals of the garage door opener according to your research. If the length of the included wire is not sufficient, you can use 18/2 solid thermostat wire from home improvement store or pretty much any other type of wire you can source around the house. In typical installation Garadget attaches to the bottom of the garage door opener using included double-sided adhesive pad. To mount the Garadget, first remove the double-sided adhesive pad from the protective sheet and apply it to the base taking care to ensure the correct alignment: The pad must sit flat within the recessed area of the mount and not cover raised edges. Ensure that the selected mounting surface is clean and dry before removing the second protective sheet and permanently attaching the Garadget to the opener. Once the adhesive grips, it’s NOT going to be easy to undo. Do not pull on the Garadget to remove it; instead try to pry along the base with the flat tool as you are leaning it to the other side. The kit includes the additional pad for the second chance. There’s a mounting hole in the base for attaching garadget where use of adhesive pad is not practical. Separate the base of the mount from the body of the device before mounting using this method. Power up mounted Garadget by plugging in its USB adapter in the spare outlet then adjust its the vertical positioning so the laser points at the flat area of the top panel of the garage door while it is closed. Tighten the mounting screw on the side. Using several strips of the scotch tape around the sides, temporarily attach the reflective tag to the door so the laser hits the center of the tag. At this point the software should be reporting the door state as “closed”. After about a day or two, permanently attach the reflector by removing the protective layer from the back and sticking it to the door panel. If the laser beam travels off the reflector due to the vibration of the opener, affix additional sticker to increase the size of reflective area. If the light from garage door windows interferes with the laser sensor, consider moving the reflector to the wall immediately above the top edge of the door. In this setup the door will block the reflection as soon as it starts to open. Garadget comes pre-set with the reasonable defaults, but you may want to visit settings screen to rename your door and review other parameters, especially while troubleshooting. The detailed information about the available settings and alerts can be found here. If you experience any difficulties with the setup, don’t get discouraged. Most likely you’re a simple adjustment away from the successful setup and we are here to help. First please check out the troubleshooting guide for solutions to the most common problems. If you still need help and you can’t find the answer in the community board join the conversation or submit a new post. For extra good karma, post the solution that worked for you. If you need to return, replace or repair your Garadget, please read this post first. Most of the time we will handle the process faster and with less hassle than the retailers. We will pay all the domestic shipping costs within 30 days satisfaction guarantee period and we’ll ship your repaired or replaced Garadget to the USA address at no cost within one year warranty period.